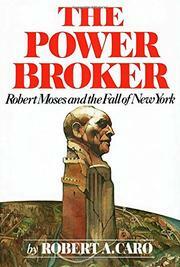 At the height of his power Robert Moses was emperor of nearly all New York State public works--bridges, highways, housing, parks, electrical power, the World's Fair and the United Nations--without ever holding elected office. In his chairmanship of twelve agencies from 1924 to 1968, Moses spent at least 27 billion dollars with immense inefficiency, utter disregard for opponents and maximum reward for friendly banks, contractors and political allies. Caro richly documents his arrogance and vindictiveness, exemplified by his penchant for bulldozing unrelocated residents' homes. At the same time, Caro's fascination with Moses, a prerequisite for writing this 1296-page biography, produces a Last Hurrah undertone right up to Moses' old age: "forgotten to live out his years in bitterness and rage." Moses reached power in a decade when Mussolini's corporatism was praised by such venerable sources as the AFL and the New Republic; and along with his mammoth public spending and chronic lying, Moses replicated tire Fascists' disregard for legality and due process, in a drive for complete personal command. Caro tends to treat Moses' history too personally, without explaining that Moses' World War I civil service reform "idealism" and his later push for highways, conservation and public works expansion reflected general leitmotifs of those political periods. The book views Nelson Rockefeller's 1968 ouster of Moses as a clash of temperaments, for example, without asking whether the Governor's transportation and urban redevelopment reorganization schemes might not have required a new, equally ruthless but lower-profiled species of administrator. However, Caro's tremendous, artfully compiled detail, based on dozens of interviews and exhaustive source-hunting, ensure that The Power Broker will be acclaimed as the definitive monument to Moses, as well as a key study of the web of political figures connected with, and against, Moses' career.